Question: How to send ajax request to another domain using JSONP? JSONP is simple way to overcome XMLHttpRequest same domain policy. With use of JSONP you can send the request to another domain. JSONP is "JSON with Padding", In JSONP we include another domain URL with a parameter i.e callback. callback's value have a function name which must be present in your webpage. Question: CanAJAX requests retain PHP login info? Question: How can I detect that the Internet connection? Make a ajax call to reliable server which always return data. To check the Internet connection, request the data to the server. If ajax call return data, internet connection is working else not. But make sure, ajax response must not come from browser cache. For this set the cache:false in ajax call. Question: How to send Query string(If query string is full URL) in Ajax call? use encodeURIComponent() before sending query string. Question: How to send ajax call with https on http page (Suppose, both https and http are same domain)? If both protocall have same domain, then you can send all ajax request with https on both (https and https page). Question: How to get response header of AJax Call? Question: Can I handle the redirection of xmlhttprequest in Ajax Call? Question: How can I get the values of all sected checkbox? Question: How to pass entire form data in Ajax? Question: How to get the error messages in jQuery Ajax? 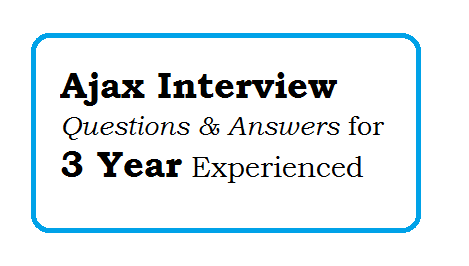 Ajax Interview Questions and Answers for Fresher. Top 10 Ajax interview Questions and Answers. Ajax interview questions and answers for 1 year experience. Ajax Interview Questions and Answers for 3 Year Experienced.